Local Expert Guide for 8/9 hours (for all the tour). The Churches included in the walking tour are: The Dome, The Seven Works of Mercy, Santa Chiara (without the cloister), Gesù Nuovo. Walking tour then along San Gregorio Armeno and San Biagio dei Librai streets as far as Santa Chiara (visit of Your guide). The cloister is not included. 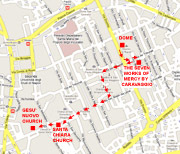 Visit with Your guide of Gesù Nuovo church. Transfer by car to the Plebiscite Square for 1 hour of free time for having a pizza (not included). This incredible tour combine the visit of the Archaeological Museum (POMPEII MUSEUM) with the visit of the most famous churches in Naples: the former is where many paintings and artifacts from Pompeii and Herculaneum are kept while the latter are sacred buildings with colourful marbles and paintings by Caravaggio, Ribera, Luca Giordano, etc . Departure will take place from Your hotel or the cruise ship with a Mercedes (or a similar make) vehicle (with air conditioning) and an English-speaking driver. When You arrive to the Dome of Naples, You’ll get off from the car and You’ll start the walking tour with Your private guide (only for You). The first visit will be the Cathedral of Sant Gennaro, patron saint of Naples, which houses a vial of the Saint's blood that is brought out twice a year, on the first Saturday in May and 19 September, and usually liquefies. According to legend if the blood should fail to liquefy, then something bad will happen to Naples. 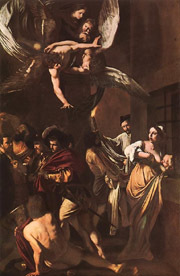 The second church to be visited is that one of the Seven Works of Mercy where the well-known painting by Caravaggio’s Seven Works of Mercy is exhibited. You’ll continue on foot (with Your private guide) along San Gregorio Armeno where You can admire numerous shops with creative nativity figurines in all variations. Besides the Jesus- and Madonna figurines You will also find detailed copies of all household objects, gastronomic delights, exotic animals, and sometimes even caricatured politicians. Santa Chiara church is the next stop, built in 1310-1340 by King Robert d’Anjou, who is also buried in the complex. The cloister is not included in the visit. Afterwards, You’ll be guided also in the Gesù Nuovo Church, which is the most important church ever built by Jesuits in Naples. It is called "Gesù Nuovo" (New Jesus), because the Jesuits had already built another Jesus Church in 1568, which therefore is now called "Gesù Vecchio" (Old Jesus). After that exciting walking tour, by Your private vehicle You’ll reach the Plescite Square where You can eat something. If You feel like, in the surroundings You can try the famous pizza of Brandi Restaurant where it was invented. Opened in 1780, Brandi was so renowned for the quality of its pizza that in 1889, the pizzaiolo (pizza chef) was invited to prepare pizza for the royal family who had never tasted it. He created a pizza with mozzarella, basil, and tomatoes -- the colors of the newly unified country's flag -- and named his creation pizza alla margherita in honor of the first queen of Italy, Margherita di Savoia. The queen accepted the offering, and the pizza became an instant favorite throughout the country. The next leg will be the sightseeing of the Naples by car (of course with Your personal driver and guide). Then the conclusion of this rich day will be the guided visit of the Archaeological Museum of Naples. This museum is the direct successor of the Royal Bourbon Museum, one of Europe's oldest and largest museums. Founded in the second half of the 18th century by Ferdinand of Bourbon, it brought together the Farnese collection and the Vesuvian antiquities. 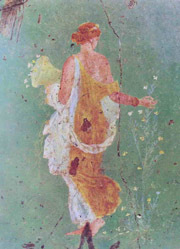 During the XVIII and the XIX centuries the museum continued to receive a lot of artifacts, both from private collections and from excavations of Pompeii, Herculaneum, Stabiae, Paestum, Cuma or elsewhere in Southern Italy. These archaeological treasures represent one of the most comprehensive and complete Greek and Roman collections in the world.